Environmental Change-Makers helps people discover the joys, skills, connections and fulfilment of the new future. We are one of the groups that are putting in place positive solutions to today’s most pressing issues. ECM is centered in the Westchester neighborhood of Los Angeles, about 6 blocks from LAX international airport. Participants in our events and activities come from all over the greater L.A. area, plus we mentor groups throughout Southern California. ECM was founded by Peter Rood and Joanne Poyourow. Joanne Poyourow is a writer, a food gardener, and an activist. She designed the Community Garden at Holy Nativity, and continues to manage its plantings for ongoing abundant harvests. She teaches many of ECM’s organic vegetable gardening classes, and helped design and found the Emerson Avenue Community Garden. She is one of the founding members of Seed Freedom LA, and has had her fingers in the changes at many other local gardens as well. In addition to having written three books, Joanne writes most of the ECM handouts, how-to guides, and booklets; she also blogs at Transition US, and co-teaches classes at Otis College of Art & Design. All this, while homeschooling two teens. Joanne’s home garden — located a few blocks from ECM’s Westchester site — is a busy place of city chickens, vegetable experiments, and weedy failures to learn from. When she slows down a bit, she takes one of Peter’s yoga classes. In late autumn 2013, ECM launched a new chapter by creating an Advisory Circle to help run its operations. The Advisory Circle currently includes Carolyn Peters, Nigel Raab, John Tikotsky, Christine Tope, and Kathy Turk. ECM began in 2005 with a circle of five local neighbors sitting in the Holy Nativity Community Hall trying to decide what we could possibly DO about environmental problems like global warming. In those days — before anyone had heard of “An Inconvenient Truth” — any discussion about global warming was more likely to provoke debate over whether it existed, than stimulate discussion about solutions. Thus ECM’s What We Can Do focus was fairly unique. In early 2008, ECM installed what has become their “signature garden,” the Community Garden at Holy Nativity, and that summer began offering the organic vegetable gardening class series. The Episcopal Diocese of Los Angeles asked Joanne and Peter to write a book about what communities could do, and Environmental Change-Making was the result. Meanwhile, Joanne had been learning about a budding circle of people over in England who were “doing something” about climate change and peak oil. In late 2008, ECM brought trainers from the UK and hosted Southern California’s first ever Transition Training. Transition Los Angeles got its start. Over time, eight local groups formed, in places like Mar Vista, Culver City, and San Fernando Valley, with ECM representing Westchester. Each of these groups had its own focus and perspective, depending on local needs and the interest of local participants. Today “Transition in Los Angeles” is the term we use to describe all the action that is happening, so much to the credit of these local groups and the partnerships they have formed with like-minded groups. 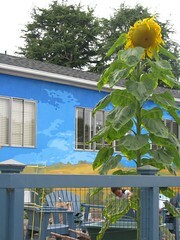 In 2009, ECM was approached to create the Emerson Avenue Community Garden. ECM saw it through design, organization, and early construction. 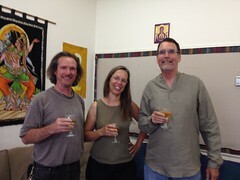 Joanne and John served on the founding board. Today the Emerson Avenue Community Garden Club functions as its own separate 501(c)(3) entity. ECM was incorporated in 2012 as a California nonprofit corporation; it is in the process of applying for 501(c)(3) tax exempt status.